Published Jul 13, 2018 by Addison-Wesley Professional. Part of the LiveLessons series. Create an end-to-end data analysis workflow in Python using the Jupyter Notebook and learn about the diverse and abundant tools available within the Project Jupyter ecosystem. The Jupyter Notebook is a popular tool for learning and performing data science in Python (and other languages used in data science). 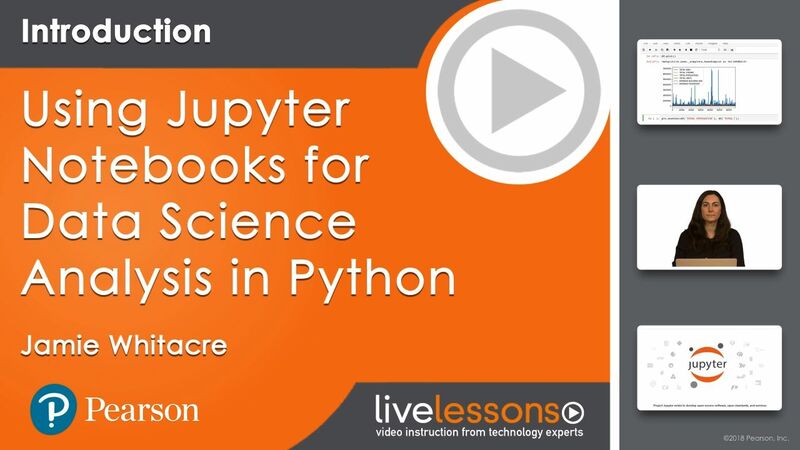 This video tutorial will teach you about Project Jupyter and the Jupyter ecosystem and gets you up and running in the Jupyter Notebook environment. Together, we’ll build a data project in Python, and you’ll learn how to share this analysis in multiple formats, including presentation slides, web documents, and hosted platforms (great for colleagues who do not have Jupyter installed on their machines). In addition to learning and doing Python in Jupyter, you will also learn how to install and use other programming languages, such as R and Julia, in your Jupyter Notebook analysis. Download and install the Anaconda distribution of Python here. You can install either version 2.7 or 3.x, whichever you prefer. Create a GitHub account here (strongly recommended but not required). If you are unable to install software on your computer, you can access a hosted version via the Project Jupyter website (click on “try it in your browser”) or through Microsoft’s Azure Notebooks. 1.1 What are Project Jupyter and the Jupyter Notebook?